Believe it or not, George Washington was once a kid. He rode horses. He thought about running away from home and going off to sea. Not only does our assessment of Washington begin before he was famous, but it also starts before the distortions of mythmakers whose accounts of Washington led them to make up stories to explain his greatness. Relatively little information about his early childhood survives, but it's clear that the story of the CHERRY TREE and that young WASHINGTON NEVER TELLING A LIE is itself a fabrication. He was born in 1732 into a Virginia family of modest wealth. Although not among the richest or most politically powerful families of the day, the Washington household property included 20 slaves by 1743. Had the family fortune continued to expand, Washington might have found himself beginning to enter the top rank of Virginia society. However, inheritance was not to be his route to greatness. George's father died when he was only 11 and he ended up moving in with LAWRENCE WASHINGTON, his older half-brother. Lawrence became an important role model for young George. He was particularly impressed by his half-brother's service in an American regiment of the British Army in a campaign against the Spanish in Colombia, South America. Another important influence on George was a local boy named GEORGE WILLIAM FAIRFAX who hailed from a prominent family. Washington's skill at horseback riding won the favor of the visiting Lord Fairfax. When a surveying party went west to measure the Fairfax's vast new royal grant of land, 16-year-old George went along for the adventure. More than just fun times, the experience began Washington's life-long interest in western lands and equipped him with surveying and backwoods skills that would serve him well in the future. As often happened in the colonial period, early death struck the Washington family once more when Lawrence died in 1752. By the age of 20 George had suffered the death of both his real and surrogate fathers. Along with this second major loss came the end of George's hopes to get an education in England — part of the required training for elite men in colonial Virginia. George inherited Lawrence's 2600-acre estate and 18 slaves who made the MOUNT VERNON plantation profitable. In a colonial world where connections to powerful people and family tradition played an important role in securing public office, George managed to win the title of major in the Virginia militia that had previously been held by Lawrence. 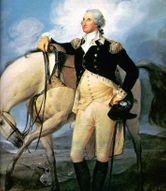 Although lacking significant military experience, George Washington was about to ride into a public career that would carry him to national fame. But first he would have to ride to the frontier and make a name for himself battling French and Indian foes. Washington happily resigned his military command at the end of the Revolutionary War in 1783. He saw himself living out his days as a farmer at Mt. Vernon. But he would be called on to lead the country again — this time not in war, but peace. During the critical period of the 1780s Washington privately feared that the weak central government dictated by the Articles of Confederation threatened the long-term health of the nation. He supported the call for a Constitutional Convention and after some hesitation attended as a delegate where he was elected the presiding officer. He took a relatively limited role, however, in the debate that created the proposed Constitution. Nor did he publicly favor ratification. It seems that his sense of personal reserve prevented him from actively campaigning. As he was likely to become the first president, he avoided the appearance of self-serving motivation by not aggressively supporting the Constitution in public. The significance of the FIRST PRESIDENTIAL ADMINISTRATION under the Constitution is hard to overstate. The Constitution provided a bare structural outline for the federal government, but how it would actually come together was unclear. The precedent established by the first president would be enormous. Washington generally proceeded with great caution. For the most part he continued precedents that had been established under the Articles of Confederation. For instance, he carried over the three departments of the government that had existed before the Constitution. But the nationalist Washington favored a stronger central government and made sure that executive authority was independent from total legislative control. For instance, Washington appointed his own head to each department of government whom the legislature could only accept or reject. Furthermore, Washington identified the three leaders (Thomas Jefferson as secretary of state, Alexander Hamilton of the treasury, and Henry Knox of war) as his personal "cabinet" of advisers, thus underscoring the executive's domain. Particularly in his first term as president from 1789-1792, Washington's enormous personal popularity and stature enhanced the legitimacy of the modest new national government. Unfortunately for Washington, events in his second term somewhat clouded his extraordinary success. For one, his own cabinet split apart as Thomas Jefferson increasingly dissented from the economic policies proposed by Alexander Hamilton, most of which Washington supported. Even more disturbing to Washington was the emergence of a new form of political activity where the public divided into opposing parties. Although now a fundamental feature of modern democracy, Washington and many others perceived organized opposition to the government as treasonous! These clouds at the end of Washington's public career, like the difficulties of his first military command in the 1750s, remind us that even this most stellar of the Founding Fathers hardly glided through public life without controversy. As impressive and even as indispensable as Washington had been to the creation of the new nation, he remained a leader with qualities that could not appeal to all of the people all of the time. Most interestingly perhaps, is that some of the personal qualities that made him extraordinarily effective are also ones that might make him extremely unpopular today. Washington consciously cultivated a distance from the public and a personal reserve that made him aloof. He was a curious combination of late-18th century qualities — a regal republican whose disdain for democratic excess helped give life, power, and respectability to what would soon become the world's first modern democracy. Washington departed the presidency and the nation's then capital city of Philadelphia in September 1796 with a characteristic sense of how to take dramatic advantage of the moment. As always, Washington was extremely sensitive to the importance of public appearance and he used his departure to publicize a major final statement of his political philosophy.WASHINGTON'S FAREWELL ADDRESS has long been recognized as a towering statement of American political purpose and until the 1970s was read annually in the U.S. Congress as part of the national recognition of the first President's birthday. Although the celebration of that day and the Farewell Address no longer receives such strenuous attention, Washington's final public performance deserves close attention. The Farewell Address definitely embodies the core beliefs that Washington hoped would continue to guide the nation. Several hands produced the document itself. The opening paragraphs remain largely unchanged from the version drafted by James Madison in 1792, while most of the rest was penned by Alexander Hamilton, whom Washington directed to remove the bitterness from an intermediate draft that the president himself had written. Although the drawn out language of the Address follows Hamilton's style, there is little doubt that the core ideas were not only endorsed by Washington but were beliefs that he and Hamilton had developed together as the new nation's leading nationalists. The Address opened by offering Washington's rationale for deciding to leave office and expressed mild regret at not having been able to step down after his first term. Unlike the end of his previous term, now Washington explained, "choice and prudence invite me to quit the political scene, patriotism does not forbid it." Washington was tired of the demands of public life, which had become particularly severe in his second term, and looked forward to returning to Mt. Vernon. Although he might have closed the Address at this point, Washington continued at some length to express what he hoped could serve as guiding principles for the young country. Most of all Washington stressed that the "NATIONAL UNION" formed the bedrock of "collective and individual happiness" for U.S. citizens. As he explained, "The name of AMERICAN, which belongs to you, in your national capacity, must always exalt the just pride of PATRIOTISM, more than any appellation derived from local distinctions." Washington feared that local factors might be the source of petty differences that would destroy the nation. His defense of national unity lay not just in abstract ideals, but also in the pragmatic reality that union brought clear advantages to every region. Union promised "greater strength, greater resource, [and] proportionately greater security from danger" than any state or region could enjoy alone. He emphasized, "your UNION ought to be considered as a main prop of your liberty." The remainder of the Address, delivered at CONGRESS HALL in Philadelphia, examined what Washington saw as the two major threats to the nation, one domestic and the other foreign, which in the mid-1790s increasingly seemed likely to combine. First, Washington warned of "the baneful effects of the SPIRIT OF PARTY." To Washington POLITICAL PARTIES were a deep threat to the health of the nation for they allowed "a small but artful and enterprising minority" to "put in the place of the delegated will of the Nation, the will of a party." Yet, it was the dangerous influence of foreign powers, judging from the amount of the Address that Washington devoted to it, where he predicted the greatest threat to the young United States. As European powers embarked on a long war, each hoping to draw the U.S. to its side, Washington admonished the country "to steer clear of permanent Alliances." Foreign nations, he explained, could not be trusted to do anything more than pursue their own interests when entering international treaties. Rather than expect "real favors from Nation to Nation," Washington called for extending foreign "commercial relations" that could be mutually beneficial, while maintaining "as little political connection as possible." Washington's commitment to NEUTRALITY was, in effect, an anti-French position since it overrode a 1778 treaty promising mutual support between France and the United States. Washington's philosophy in his Farewell Address clearly expressed the experienced leader's sense that duty and interest must be combined in all human concerns whether on an individual level or in the collective action of the nation. This pragmatic sensibility shaped his character as well as his public decision-making. Washington understood that idealistic commitment to duty was not enough to sustain most men on a virtuous course. Instead, duty needed to be matched with a realistic assessment of self-interest in determining the best course for public action. To this day, Washington's Farewell Address is considered to be one of the most important documents in American history and the foundation of the Federalist Party's political doctrine. Despite his stated desire to retire from public service, Washington would later accept a commission from President John Adams, although Adams was largely forced into providing the commission by members of the Federalist Party, as the Senior Officer of a Provisional Army formed to defend the nation against a possible invasion by French forces during the Quasi-War. 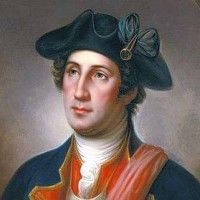 Despite spending months organizing the Officer Corps of the Provisional Army, Washington held true to his statements in his farewell address and declined suggestions that he return to public office by running for reelection in the presidential election of 1800. Washington's statements on the importance of religion and morality in American politics, as well as his warnings on the dangers of foreign alliances, although often stated and recognized arguments, were provided special consideration from the pen of an American hero and became common reference during political debates well into the nineteenth century. Extols the benefits of the federal government. "The unity of government...is a main pillar in the edifice of your real independence...of your tranquility at home, your peace abroad; of your safety; of your prosperity; of that very liberty which you so highly prize." Warns against the party system. "...cherish public credit. One method of preserving it is to use it as sparingly as possible...avoiding likewise the accumulation of debt....it is essential that you...bear in mind, that towards the payments of debts there must be Revenue, that to have Revenue there must be taxes; that no taxes can be devised, which are not...inconvenient and unpleasant..."
Warns against permanent foreign alliances. On an over-powerful military establishment.